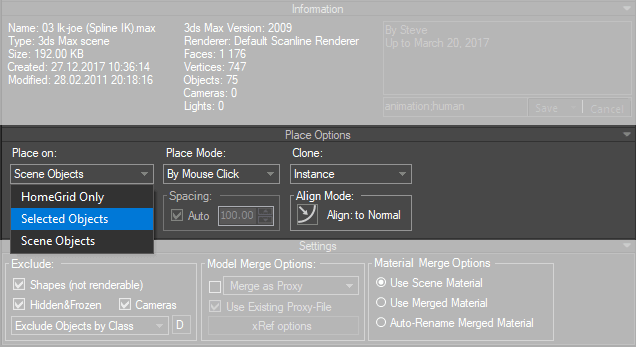 In the Models Tab of Project Manager, there are several ways to merge 3D files. One of the simplest ways is the Drag & Drop method, which allows for more direct control. 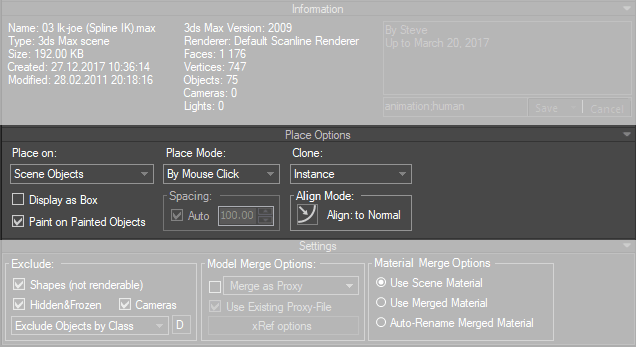 From here, you can select multiple objects to merging into a scene. 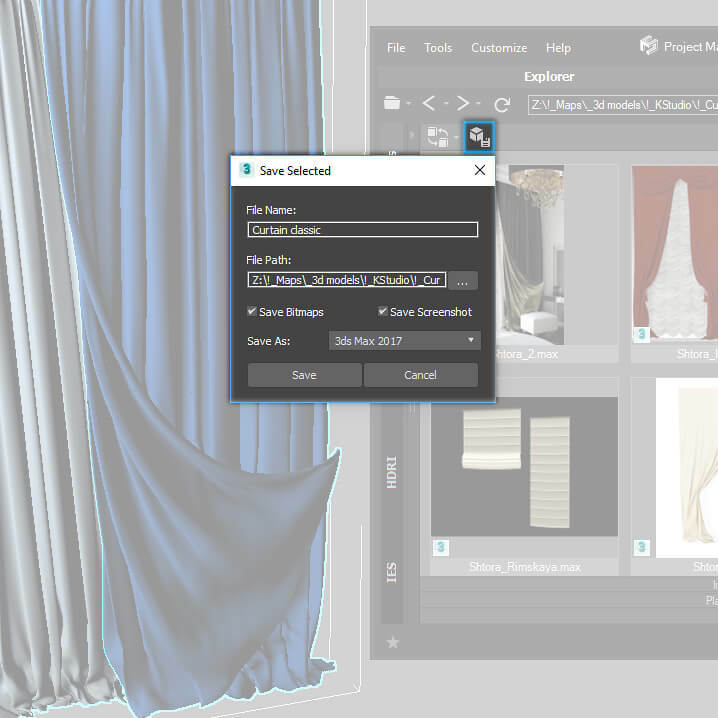 This process can then be duplicated by double-clicking on the model’s file. 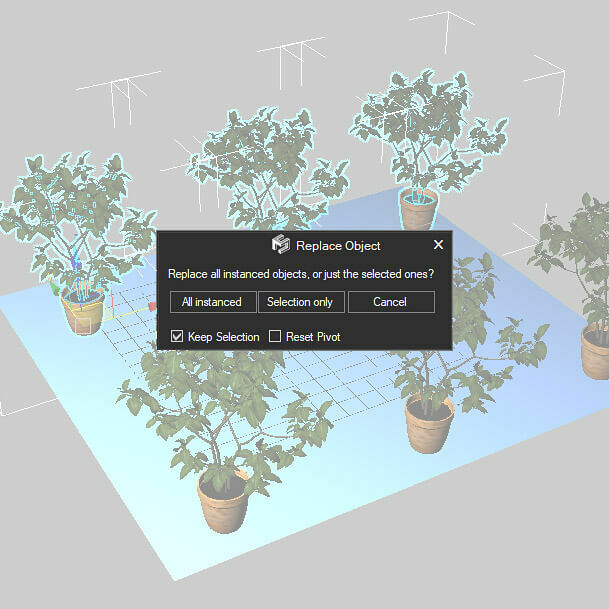 Models from the selected file will be merged and placed in the current scene without any additional dialogs. 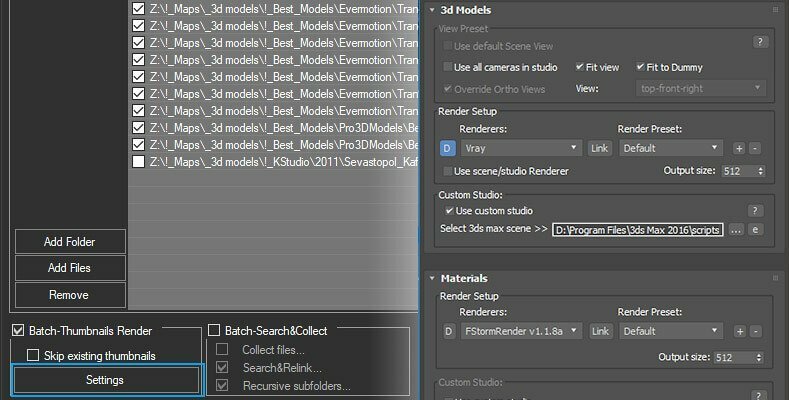 In addition, 3D models can be merged as a Proxy or merged as Xref objects. Proxies can be created from files such as .VRMESH, which produces a Vray Proxy when dragged into the viewport. 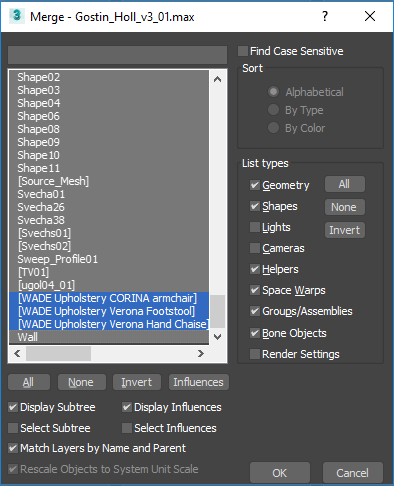 Due to Project Manager’s support for many renderer engines, you can use Vray, Corona, Mental Ray, Octane, Maxwell and many other types of proxies in your scenes. To enable the converting of models to proxies, tick the checkbox as seen in the image below. 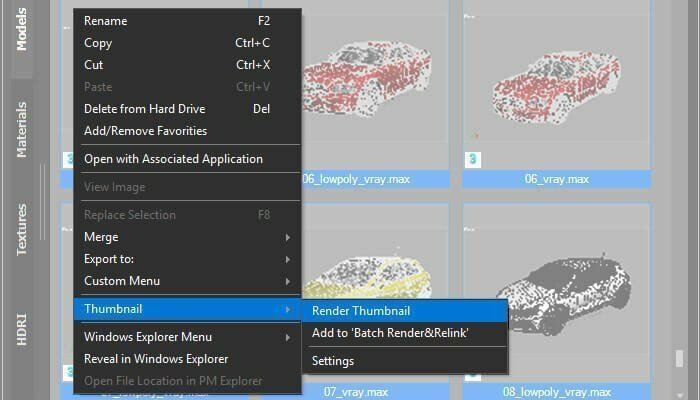 The type of proxy will depend on the active renderer for your scene. 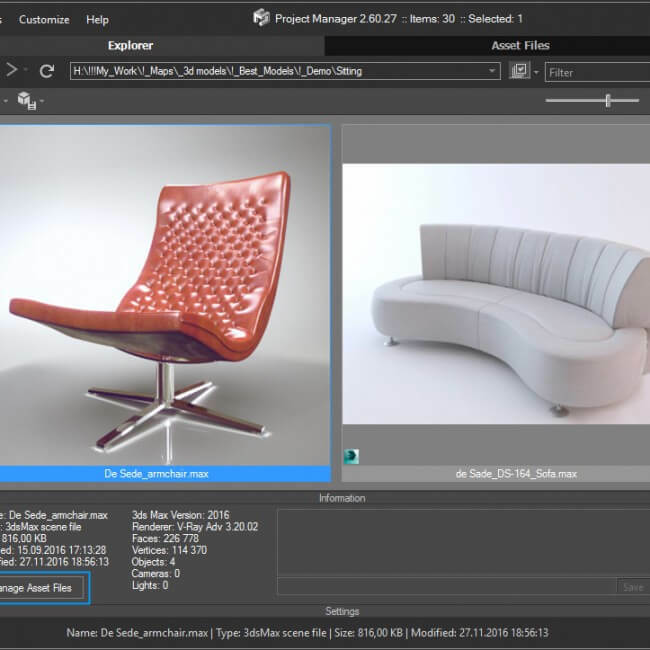 So using Project Manager you can convert your 3d models on fly to Corona Proxy, Vray Proxy, Octane Proxy, FStorm Proxy, Sini ProxSi and etc. Also, the Project Manager has the unique ability to store proxies with materials. 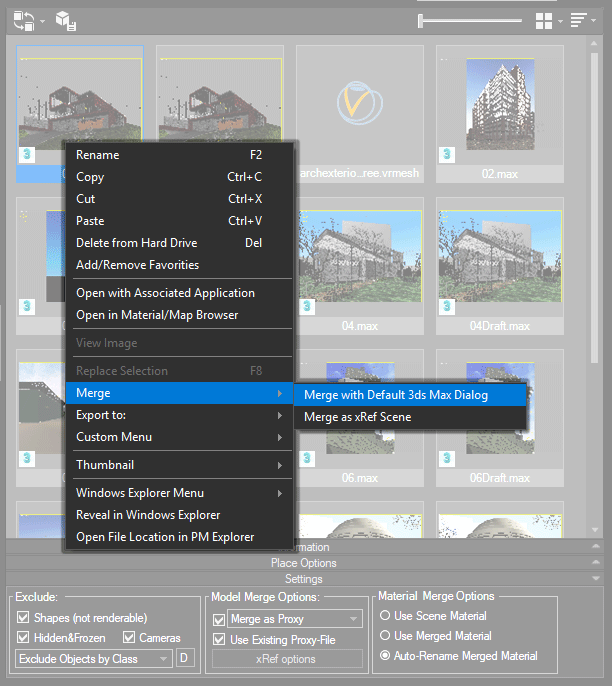 Also in this menu, you can choose the options “Merge as xRef objects”, “Merge as Sini ProxSi” or “Merge as SmartRefs”. 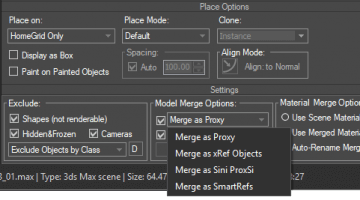 The last two options are available if you have installed Sini ProxSi and SmartRefs plugins. 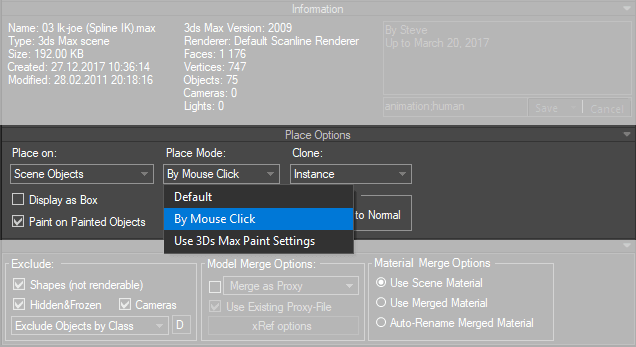 In the latest version of Project Manager, objects can be placed by a simple mouse click, or be “painted” onto a scene using the 3DS Max paint settings. Not only can merged nodes be placed according to a Home Grid, but they can also be placed on all objects in a scene, or just a few. Smart Align Mode is now available, as illustrated above. 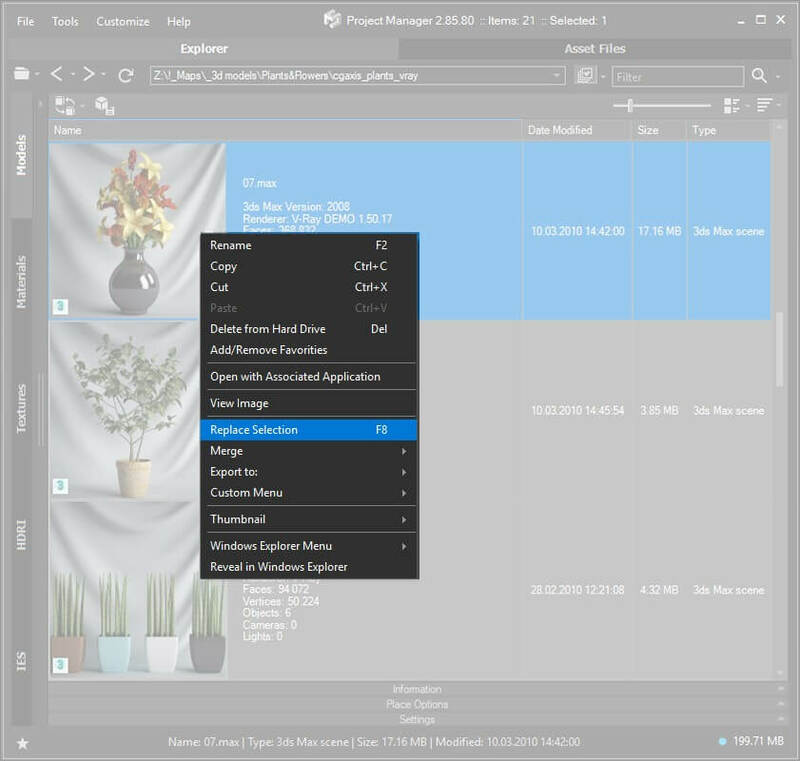 Smart Align uses appropriate object orientation automatically. Using the “Smart Align” feature allows for a more convenient mode of placing objects in interiors—such as snapping paintings/sconces onto walls and chandeliers onto ceilings. 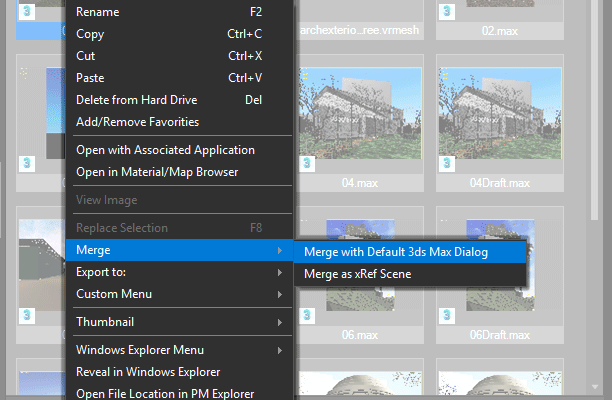 In addition to several merge methods, PM allows you to exclude merged objects by type, such as cameras and lighting. 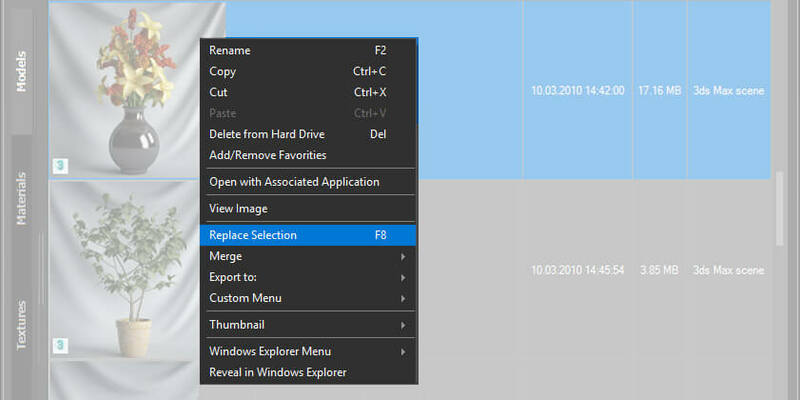 Objects in scene may also be replaced to objects from file by using the “Replace Selection” option, pictured below. 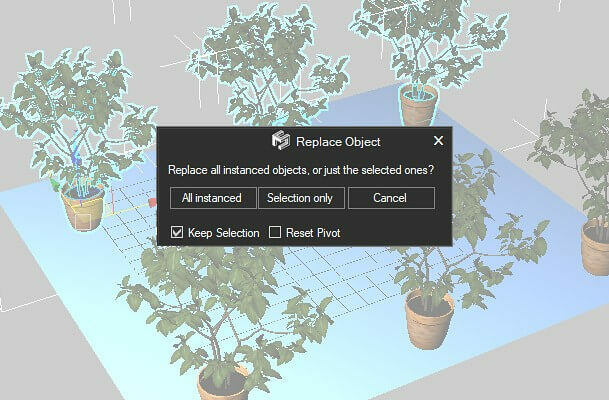 This option allows for one-by-one object replacement so you can easily modify your project back-and-forth to get the perfect scene. 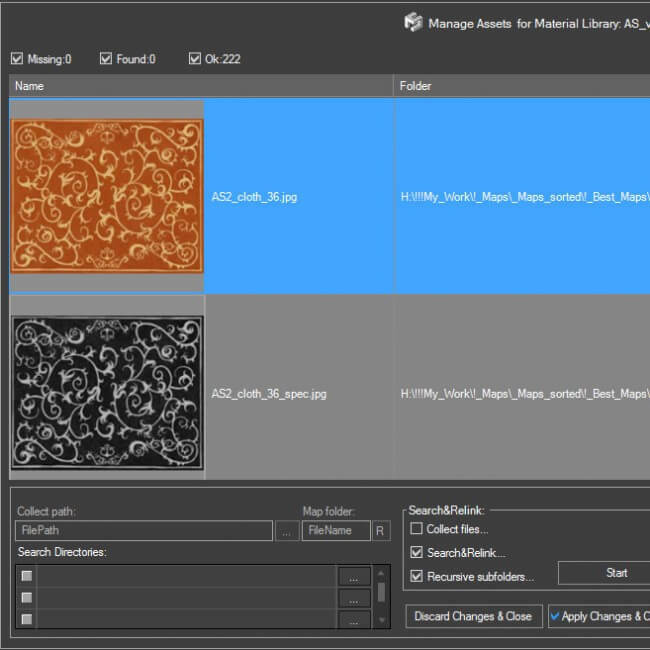 Models can be exported to a variety of formats, shown below. 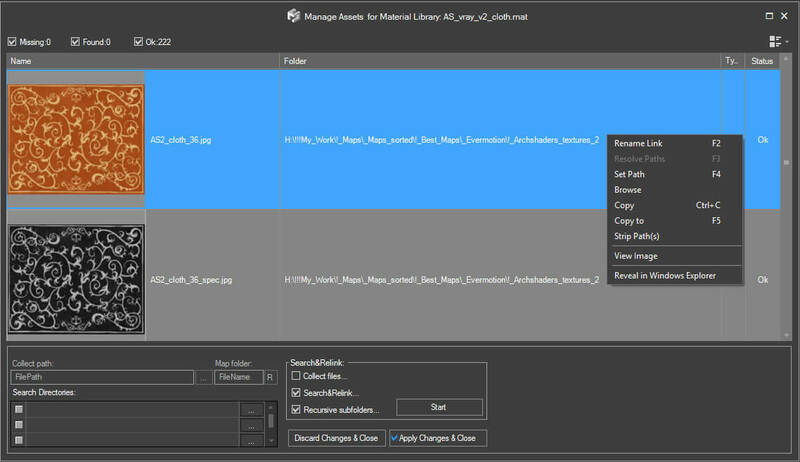 This handy feature adds greater compatibility to your projects, should you need to access them in any other program. 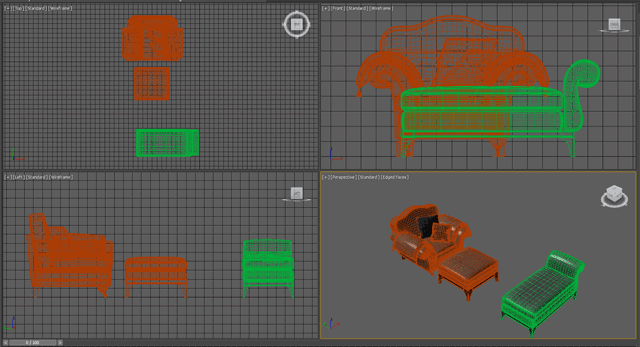 Objects can also be added to the library directly from a scene, as illustrated below. 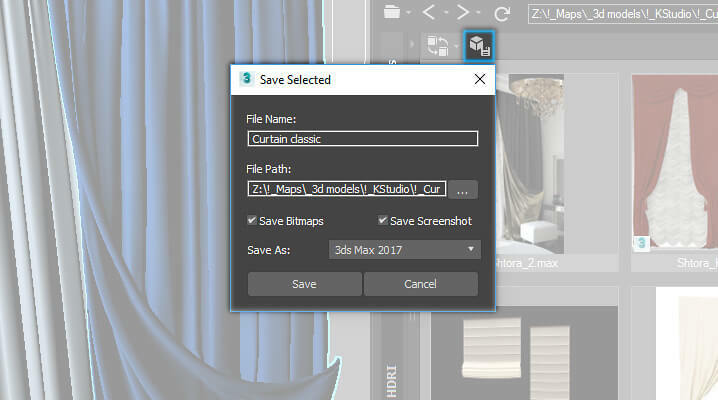 By clicking on the indicated button, a context menu will appear, and you can save the selected model along with a screenshot and used bitmaps. 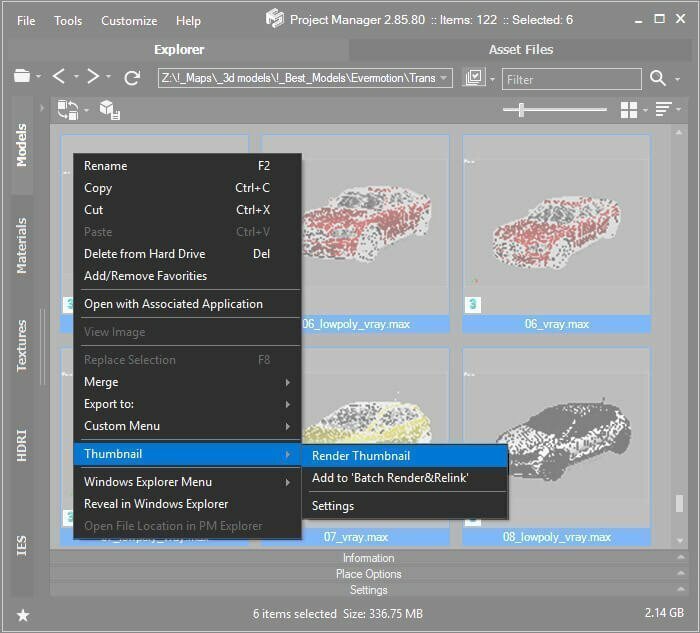 You can also render thumbnails, either directly from Project Manager or by using the “Batch Render & Relink” Tool, found under the “Tools” Menu toward the top of the Project Manager window. 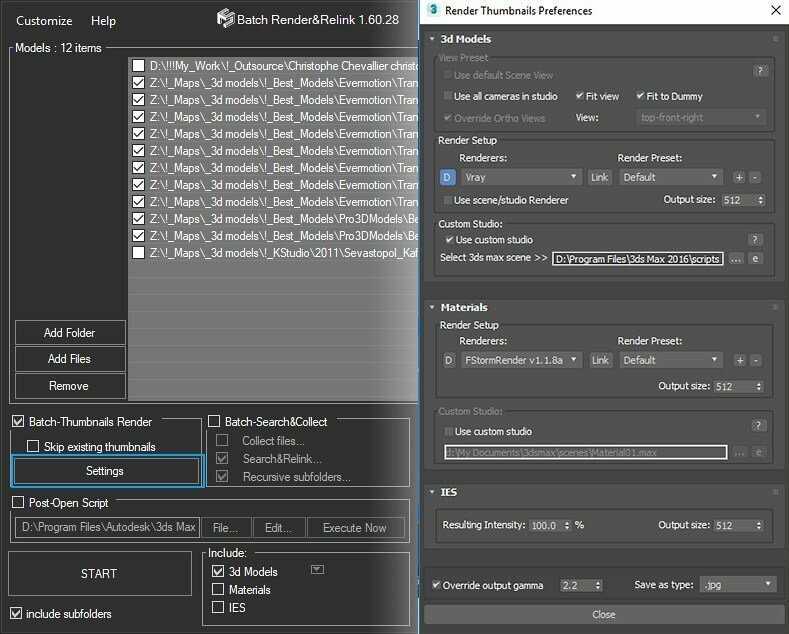 Here, you can also easily relink 3DS files, or do so directly from the Explorer Tab. 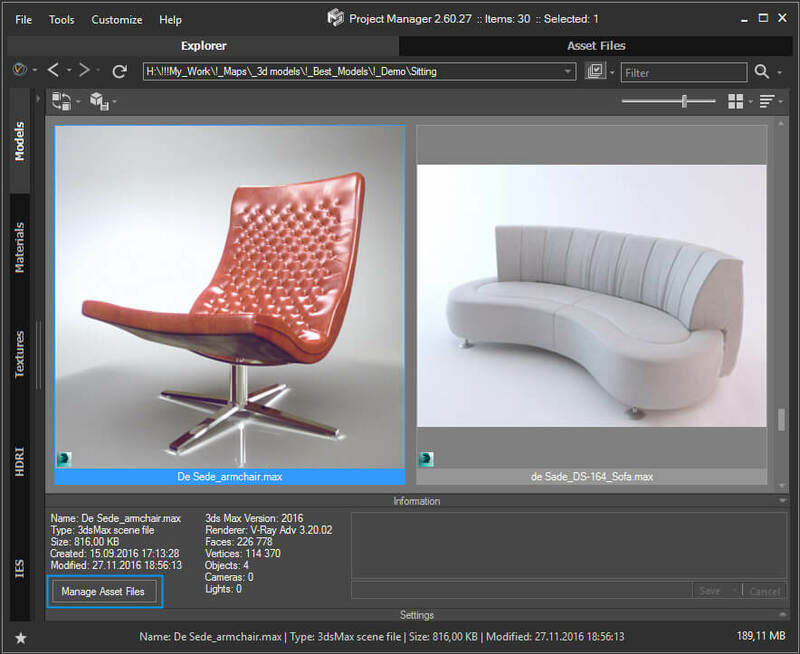 With the above mentioned features, it is now easier than ever to save, access, and use your project files. 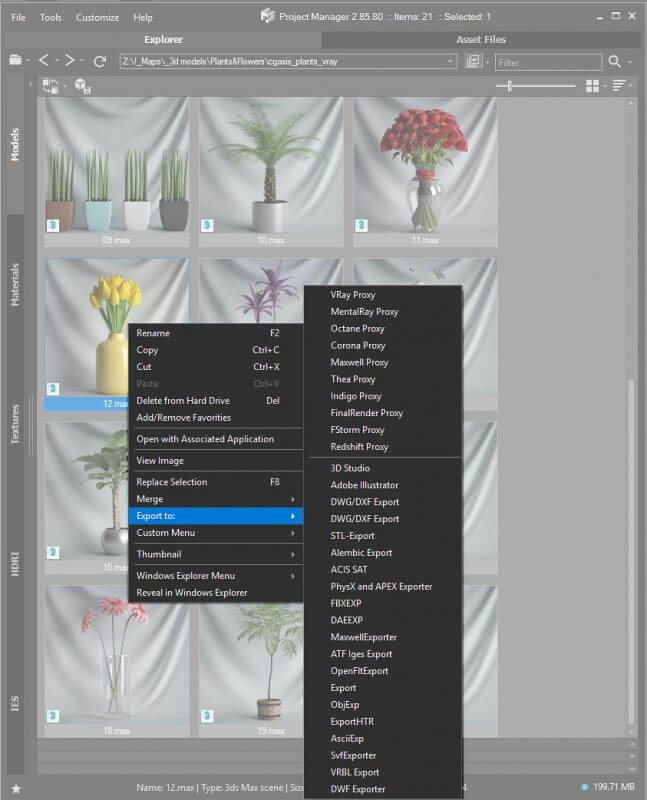 With Smart Align and Drag and Drop, placing and merging objects and models becomes a more intuitive process that saves time. In addition, the wider variety of supported formats means greater flexibility with your projects. Related to "Working with 3D Models in Project Manager"